The History within the HM wiki Past members and remembered past. Arena is one of Harvester's favorite pastimes. Learn arena basics here. Activities change pretty quickly. Stay up to date in our forum. Few things survived the past better than The Weekly Harvest Archives. Meet the Godville users on Discord. Read all about Harvest Moon on our wiki. Best presents for any occasions at our store. Godville Talent Show Season 2! Once upon a time, in a faraway land, was a group of six friends who enjoyed slaying, earning experience, raiding dungeons for loot and glory, and having a good time together. These people had met under the aegis of a federation called Harvest Moon, and enjoyed each other’s company. One day, one of the lads of that group asked the party if they wanted to explore a country; a land full of mystery, novelty, and lack of graphic interface. Willing to depart for a new adventure, the group left to that new place going by the name of Godville, leaving behind anything they had ever known, and delving into that new realm. After getting used to this province, they decided to implant themselves for good and let their name be spread, that is when they created a guild - a guild named Harvest Moon. Very quickly, that name became widely known. Indeed, tales of their achievements had reached every corner of Godville, and soon, members upon members joined that group, setting the first stone of the establishment that would become one of Godville’s greatest guilds. Due to the evil nature of its founders, HM became widely known as a place where scoundrels and evildoers of all kind could gather and feel at home. As a result of that fame and reputation, many heroes and guilds throughout Godville started looking at Harvest Moon with contemptuous and jealous eyes, forcing them to temper their evil behavior for the sake of the people. Little did they know that this led to a dramatic slow-down in Harvest Moon’s implication in Godville’s life. Tournaments became scarce, duelers became less active, and the overall activity dropped. Due to its notoriety, the guild still stayed prominent and heavily present in the pantheons. Time passed, and Harvest Moon’s evilness perdured through tales and evil acts here and there. The founders had become a rare sight, and a new generation of heroes were now doing the Harvester’s dark biddings. That is when The Great Harvester Of Sorrow decided that it was time. It was time to restore Harvest Moon’s past glory. In order to gather enough strength for that humongous task, he devoured the Elders, making one with them and guaranteeing that they would forever be at the very center of Harvest Moon’s whereabouts, and named new heroes, new Gods, to take over the legacy. We normally fight to win. Relentless adskickery will ensure a steady climb in the pantheon for Harvest Moon and promote the guild through a display of skill and high ranks in the dueler/gladiatorship pantheons. It is not, however, compulsory to fight to win. This game is meant to be played and enjoy as you see fit as long as you don’t break official GV rules. The arena mechanics are such that the only factor limiting your success will be your definition of morals. Everybody in the arena has their own definition of what is fair and what isn’t and plays according to that personal code. A partial list of things people might believe is fair or unfair includes: buying charges, using multiple accounts, sniping, announcing, jumping announcers, matching friends on purpose, and hunting. Every single dueler will have a different view on what's fair and not. You will inadvertently anger somebody sometime with your play style. Don’t let people dictate what is acceptable: for every person that doesn’t agree with you, there might be a hundred others doing the same thing. If you ask yourself “can I do that?”, and if it doesn’t go against any rule set by Godville, the answer is yes. Do it. Originally penned by Brihtnoth, the following document has been adapted for guild-wide use. your attention is diverted from your own hero/ine and their well-being for whichever reason. the ducktarded delusional unfounded notion that other deities have a moral responsibility to take care of your hero or heroine in a dungeon at all costs. The driver may attempt to minimise the adventure points gained by your hero/ine’s guild by killing them off. until he is sufficiently satisfied. hold a grudge against the driver for longer than five minutes, which start at the instant you discover your hero/ine is or was the (attempted) victim of an attempted optimisation or minimalisation of the motives mentioned under 2. 5 If you feel unhappy with the (style of) driving of or the direction taken by the driver, you are free to approach him via the private messaging system (barring for purposes such as mentioned under 4.3), and kindly and gently express your thoughts. The driver is a sociable and conscientious person and will always respond in kind to whichever way he is approached, even to suggestions to take over driving from him, but only if sufficiently prefaced with kindness and a pinch of humility. 7 When a Harvest Moon member is not the driver, they may opt to let their hero die the death of the AFK. In this case, they do not care. You may parade around the killing of their hero as a badge of honour and boast about it for all they care. Congratulations, you won something in a game. You understand that there is no hint with the name of your hero/ine on it until you have explored it. bothering nobody and try to get modest or outrageous amounts of treasure. perpetuating the completely unfounded perception of Harvest Moon members all being heartless and soulless bullies. 4 When the HM member is AFK, they may choose to let their hero be sunk. In this case, they do not care. You may parade around the sinking of their hero as a badge of honour and boast about it for all they care. Congratulations, you won something in a game. All is fair within the rules of Godville for recruiting outside members. The best way to attract awesome members is by being active and impressive. Of course, threats, blackmail, bribery, and other forms of indoctrination are very much encouraged when recruiting too. The guild totem monster is the boss of HM. Everyone in HM answers to the CEO. The boss is appointed by the elected leader of HM and must fight the former totem to the death before leading HM. The totem is the Boss of HM but, like most bosses, doesn’t want to be disturbed except to execute AFKs, drink their blood, and play ball games with their severed heads. Executive executioners. In charge of all daily activity, educating noobs, and sacrificing the lives of all goody goodies. Serves four-month terms, can serve unlimited terms. Appoints supervisors by simple majority. Can execute any supervisor with unanimous support. In charge of spotting the awesome amongst guild members, supporting the guild, and keeping the management board in check by way of corporate violence. Can execute any manager with simple majority. A great place to start in one's desire to move up the ranks of Harvest Moon. Members listed here actively represent how great HM can be. These Representatives shall travel these lands in advancement of our guild, delivering our word to those who’ve been deemed worthy enough to receive our blessings, as well as those who dare oppose our rule. These evil-doers managed to kiss enough hands and shake enough babies to earn the popular vote of all members ranked Cardinal or above. If they aren't on your friends list, they should be! They've earned the honor to choose their method of execution if they ever leave the guild. Bellatrixie The Strange 庙舟畜(U • C • T)  Crushed by pigs 1727 g.e. Beeporama 庙舟畜(U • C • T)  Buried alive 1808 g.e. Empress Kerry 庙舟畜(U • C • T)  drowned by wasps 1825 g.e. Ar-Sonfyr the Liar (U • C • T)  Death by captcha 2076 g.e. The Sock 庙舟畜(U • C • T)  Death by dry cleaning 2101 g.e. Enoch Metatron 庙舟畜(U • C • T)  Tarred & feathered 2235 g.e. The Real Nicolas Cage 庙舟畜(U • C • T)  D-listed to extinction 2364 g.e. Krohnos 庙舟畜(U • C • T)  Death by snowflakes 2503 g.e. DiamondHard 庙舟畜(U • C • T)  Stuffed with candies and ripped apart like a piñata 2635 g.e. Nyx of Darkness 庙畜(U • C • T)  Death by dehorning 2771 g.e. Jels 庙(U • C • T)  Death by alt-banning 2905 g.e. Dombinator 庙舟畜(U • C • T)  Suffocation by 300lb facesitting 3039 g.e. Hairplug4men 庙舟畜商馴(U • C • T)  Impaled by Doctor Frank-n-furter 3173 g.e. Our guild is proud to be home to the best and evilest members in all of Godville. 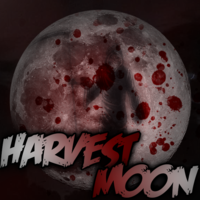 Our members can be viewed at the Harvest Moon Stats Page. Our allies work together with us in mutual goals providing mutual benefits and maximum power. Our enemies are respected, skilled and overall our biggest competition in Godville. to be the best we will beat the best, or the next best thing. As with any professional organisation, Harvest Moon has its own sociolect. The expressions and words used broadly fall into two categories: swearing and announcing. Swearing: is disapproved of. We may be evil but are also civil. Shifty: adjectival form of shift. Note: calling your hero(ine) a Smelly Poopy Face is accepted. Functional expressions (swearing is highly functional too, so let's forget that word) that are used to make everyday business run smoothly. NM: no match, also: "nobody wanted to play with me, and now I'm all alone crying by myself". 19:41 Stared at the moon. The moon stared back. 08:50 There's a waxing moon tonight. I expect a hairy residue in the morning. 10:56 No matter where I go, the moon is always there. Is it following me? This page was last edited on 10 April 2019, at 18:31.